“You shouldn’t have seen that. Try and forget it.” That’s what Roland West says after Tom Purcell walks in on photos of his dead wife and possible daughter. For inveterate puzzlers, “If You Have Ghosts” provides some choice dates and details to enter into your spreadsheets or tack up on your bulletin board. Lucy Purcell died of a presumed OD just outside Vegas, less than a year after cousin Dan O’Brien’s last known sighting there. Mary July, the “nutty” girl believed to be Julie Purcell, tells stories of herself as “a secret princess” “from the pink rooms.” Someone claiming to be Julie (“that’s not my real name!”) rants to the police hotline about “the man acting like my father”; at Will’s funeral, their grandmother speculated that Julie might not be Tom’s biological child. Roland and Lori (Jodi Balfour) met in 1980 when West and Hays fingerprinted the congregation; they split up two years later and reconnected three years after that, right around the time West “pulled [Purcell] out of that hole.” Will’s backpack and a partly burned sweater—“the evidence” that posthumously convicted Brett Woodard of Will’s murder—appears to have been planted, and a cop who witnessed its discovery in 1980 disappeared in 1990. That’s a lot of nuts and bolts, a lot of dates and names and overlapping timelines. You shouldn’t have seen that. Try and forget it. 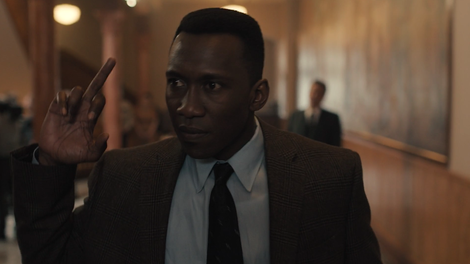 True Detective is always strongest when it favors character-building over mystery-building. Whatever happened to the Purcell children is a tragedy. And whatever happened to them—whatever was done to them—is a mystery, in the sense that it’s unsolved. But it’s not the mystery. The real mystery, the mystery that matters, is what Wayne Hays did, what his partner did, how those actions changed their lives, their families, their futures. How those actions became their lives. Everything else—even what happened to Julie and Will, even what will happen to Tom—is just so much framing narrative. From the moment Wayne Hays joins Roland West’s 1990 task force in “The Hour And The Day,” their dynamic has been one of tension and balance. In that first meeting, detectives and camera alike shifted focus between West and Hays. In “If You Have Ghosts,” that uneasy but unintentional shifting of powers becomes a split between the two until Wayne and Roland face off over the possible discovery of Julie Purcell. “I’m just saying I don’t want us fixating,” says Roland, the boss who’s indulgent but only to a point. “Until we find her, this is her,” Wayne responds, a man speaking to his equal. Roland West doesn’t withhold those grainy stills from Tom Purcell just because he wants to spare the man some suffering. Tom hasn’t seen his daughter in a decade; “he could make it into her even if it’s not.” Not everything is a puzzle, susceptible to tireless peering and fiddling. That’s the energy of “If You Have Ghosts” summed up in five words. The episode spends its hour-plus exploring the ways two charismatic personalities, two strong wills, can pull a conversation, and a situation, from one extreme to another. Roland holds his task force’s attention only until Wayne Hays opens his mouth, and retains authority over his former partner only by mutual silent agreement. The AG’s big press conference (once again held against the task force’s advice) gets upstaged by a former colleague intending to overturn Woodard’s conviction. At dinner with Roland and Lori, Wayne repeatedly shuts down conversation about the ongoing Purcell case, escalating his reasons from “no one wants to talk about that” to a reluctance to shop-talk to the absurd “It’s classified.” From dinner chitchat to last words, “If You Have Ghosts” showcases the struggle to retain command, to control a conversation, to make the last move and have the last words. In the assault on Brett Woodard’s booby-trapped home, writer/director Nic Pizzolatto delivers a competent, even shocking action scene. But that’s all it is, with none of the taut drama of Cary Fukunaga’s justly famous six-minute tracking shot, nor the brutal efficiency of another of season one’s raids. It’s coherent, it’s startling, it’s gruesomely clear. And it’s almost meaningless, seeing these nameless local vigilantes and back-up cops get blown up or blown away. The only meaning comes from the quiet culmination of this violence. For Wayne Hays and Brett Woodard, both Vietnam vets, the scene’s sudden, irrevocable slide into bloodshed is far too familiar. Their conversation ends, as Woodard intends it to, in his death at Hays’ hand. But even their tough-guy talk is just another of the episode’s battles to control conversations. Little Henry and Becca Hays are old hands at changing the conversation. When Wayne and Amelia come home bickering, the two children break up their squabble, and their parents immediately switch from sniping to offers of medicine and comfort. It’s the most effortless of the dynamic shifts in the episode, and it shows how practiced these children are at ending their parents’ fights. It’s easy to imagine the Hays children passing the same notes found in the Purcell kids’ rooms: don’t listen, I’ll always keep you safe. As the Hays family snuggles down in “the big bed” together in 1990, Wayne Hays fumbles up his stairs in 2015, frantically flipping switches as he searches for his family. Through the open bedroom door, he spots all four of them, himself included, listening to Amelia read The Jungle Book. This is the centerpiece of the episode—not the gory explosions at the Woodard place, not the quietly fearful conversation between Hays and Woodard that concludes it. Not even the reunion of Hays and West, old men with lined faces and tired memories. Because in this scene in his bedroom, all three incarnations of Wayne Hays appear: the quavering old man watching from the doorway, the husband and father lounging with his family, the stunned detective fresh from a shoot-out. Carmen Ejogo, Kennedi Lynn Butler, Isaiah C. Morgan, Mahershala Ali. But there are more than three versions of Wayne Hays, just as there are innumerable versions of us all. Just minutes before, we’ve seen Wayne play two roles in one moment, sending off his babysitting mother-in-law with smiles and hugs, a mask of silent contempt ready to drop over his face just as it drops over his wife’s. As Amelia tells Lori over dinner, she wrote her first book about the Purcell case, and about “us.” If there’s any mystery left in True Detective that matters, it’s the mystery of how it becomes us, and how to reconcile the many versions of us. 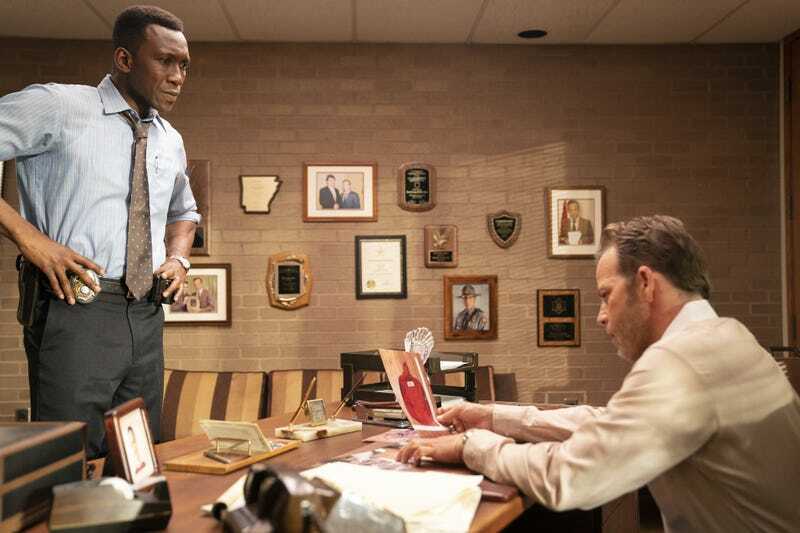 In “If You Have Ghosts,” True Detective loses sight of its core mystery: What is happening inside the head of Wayne Hays, a gifted detective and a compelling persuader, as he tries to remember what he’s done and who he has been. Wayne and Amelia’s love scene is smartly handled: a few seconds of intense connection, then a door that shuts us out. “Nobody was compelled to look too hard” could be a policing motto in this nation, as well as an explanation of how quiet, systemic racism flourishes under our eyes.